INTRODUCTION: Mary Gentle has written a couple of the most memorable sffnal novels I've read, namely the two alt-history novels A Sundial in the Grave: 1610 and Ilario, both deserving a place on my all time "more favorites list". She also has written the somewhat (in)famous Orthe duology of which the final volume Ancient Light courageously follows the logic of the story to its more natural conclusion, rather than the more standard "it'll be alright in the end" that even last year's Embassytown - which follows the same kind of story - presented. So any new novel by her is a priority for me and I've been impatiently waiting for The Black Opera since it was announced a few years ago. "Naples, the 19th Century. In the Kingdom of the Two Sicilies, holy music has power. Under the auspices of the Church, the Sung Mass can bring about actual miracles like healing the sick or raising the dead. But some believe that the musicodramma of grand opera can also work magic by channeling powerful emotions into something sublime. Now the Prince's Men, a secret society, hope to stage their own black opera to empower the Devil himself - and change Creation for the better! Conrad Scalese is a struggling librettist whose latest opera has landed him in trouble with the Holy Office of the Inquisition. Rescued by King Ferdinand II, Conrad finds himself recruited to write and stage a counter opera that will, hopefully, cancel out the apocalyptic threat of the black opera, provided the Prince's Men, and their spies and saboteurs, don't get to him first. And he only has six weeks to do it." ANALYSIS: While Ilario and 1610 were clearly sfnal, The Black Opera is fantasy-nal as it has souls, returned dead, ghosts and music as magic. It is also lighter and the least "serious" of the three with action that resembles an operatic plot in many instances. I am not that familiar with opera terminology and customs but I enjoyed the parts set into its world - bare-bones plot - bad guys want to use a special opera to bring down society for the greater good of course, good guys have to write/compose/perform a "counteropera" to stop the bad guys, though of course things are subtler in many ways. The main characters of the book are part of the opera world in a role or another with a few kings, emperors, cardinals and soldiers added in since we are in sff hence we deal in saving the world and they are quite vivid and stand out with different personalities. The action takes place by and large in the 1820's South Italy - home of the opera after all - though there is some backstory and some detail about the rest of the world. As mentioned above the operatic touch means that the novel balances between over-the-top fun and more serious stuff, but the author's skill is such that it is always a pleasure to read as the dialogue is crisp and funny - with occasional touches of subtlety and depth - and you slowly get to care about the characters and their fate. In traditional operatic mode there are powerful emotional scenes - while Mary Gentle's storyline twists and turns quite a lot. If there is a weakness beyond the general lightness, "this is a story and it cannot be truly real" and of course assuming that the balancing act mentioned above works for you - I would say it is the choice of Kingdom of the Two Sicilies as the focal point of the movers and shakers of the action which of course makes sense from an opera point of view but not really from a sffnal point of view so to speak. Overall The Black Opera is a highly recommended novel for 2012 but its ultimate lightness will keep it from my top of the year. 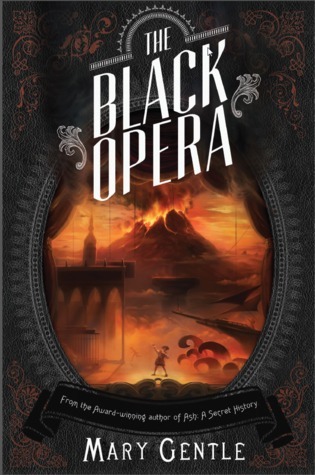 Sign into Goodreads to see if any of your friends have read The Black Opera.